The complexes of selected long-chain arylpiperazines with homology models of 5-HT1A, 5-HT2A, and 5-HT7 receptors were investigated using quantum mechanical methods. The molecular geometries of the ligand–receptor complexes were firstly optimized with the Our own N-layered Integrated molecular Orbital and molecular Mechanics (ONIOM) method. Next, the fragment molecular orbitals method with an energy decomposition analysis scheme (FMO-EDA) was employed to estimate the interaction energies in binding sites. The results clearly showed that orthosteric binding sites of studied serotonin receptors have both attractive and repulsive regions. In the case of 5-HT1A and 5-HT2A two repulsive areas, located in the lower part of the binding pocket, and one large area of attraction engaging many residues at the top of all helices were identified. Additionally, for the 5-HT7 receptor, the third area of destabilization located at the extracellular end of the helix 6 was found. where EI, EIJ are the energies of the monomer and dimer, respectively. For the receptor–ligand complexes, each residue which participates in ligand binding could by represented by fragment, whereas ligands can be represented by a single or multiple fragment as necessary. The result is the matrix of individual pair interaction energies (PIE) between all fragments. Additionally, the applied pair interaction energy decomposition analysis method (PIEDA or FMO-EDA)  supplies the electrostatic, exchange, charge transfer, and dispersion contributions to the total interaction energies, which is particularly useful for studying protein–ligand complexes. Currently, FMO allows also to estimate the solvation contribution by interfacing with the polarizable continuum model (PCM) method . 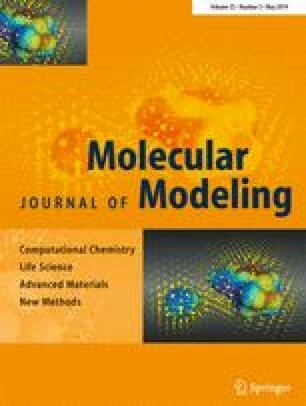 The FMO methodology was successfully applied to various large biological systems, primarily in a retrospective analysis of binding sites [5, 6, 7, 8, 9, 10, 11, 12, 13, 14, 15, 16], but also as a tool supporting drug design [17, 18, 19, 20]. Among these, several studies [7, 11, 16, 18] have focused on one of the most important groups of biological targets, a G protein-coupled receptors (GPCRs) family. The authors found crucial interactions that were often ignored by structure-based descriptions and indicated that the FMO scheme would be a valuable tool for structure-based drug design by estimations of the chemical character of the proteins binding site. In this work, quantum chemical methods were used for the energy characterization of binding sites of 5-HT1A, 5-HT2A, and 5-HT7 receptors. 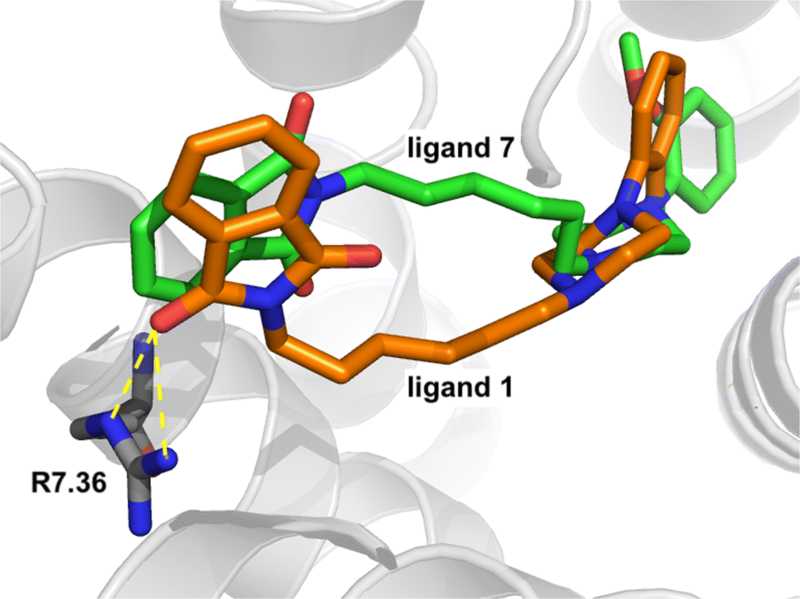 First, molecular docking was used to build ligand–receptor complexes of eight long-chain arylpiperazine ligands with three homology models of the above-mentioned serotoninergic receptors. Next, the ONIOM was used to optimize the molecular geometries of L-R complexes obtained in molecular docking study using the B3LYP(DFT):AMBER(MM) approach. The optimized complexes were then subjected to ab initio FMO-EDA calculations at the MP2/6–31G* level of theory. We recently applied a similar scheme to investigate the allosteric binding site of the other GPCR—metabotropic glutamate receptor 1 . To the best of our knowledge, this is the first study that employed ONIOM and FMO to analyze the structure of the orthosteric binding site of selected GPCRs. 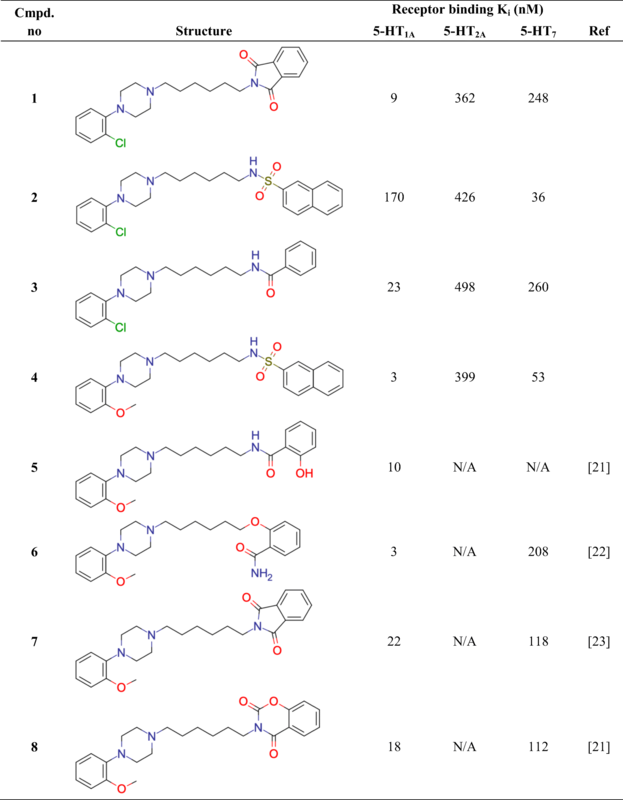 The pilot series of an active to 5-HT1A receptor, long-chain arylpiperazine derivatives (Table 1), were used for the energy characterization of 5-HT1A, 5-HT2A, and 5-HT7 receptors orthosteric binding site. The affinity of the compounds was evaluated in vitro by radioligand binding experiments as described previously . Selected ligands belong to a very popular and widely studied class of compounds for these pharmacological targets [22, 23, 24, 25]. The calculation scheme was as follows: molecular docking, ONIOM optimization, and single-point energy calculation with FMO-EDA method. Due to the known pharmacological profile of the lead molecule 1 it was used as a case study. The homology models of the selected serotonin receptors, namely 5-HT1A, 5-HT2A, and 5-HT7, were built on the D3 template, using the procedure described in our previous study [26, 27]. The LigPrep v3.6 and Epik v3.4 were used to prepared the three-dimensional structures and to assign appropriate ionization states at pH = 7.4 ± 1.0 of the ligands, respectively. If the absolute configuration of the stereocenter was not specified, both enantiomers (R and S) were generated and used in the docking. The proteins’ structures were prepared (amino acid ionization states and checking for steric clashes) by Protein Preparation Wizard. The receptors’ grids were generated (OPLS3 force field) by centering the grid box with a size of 12 Å on the D3.32 side chain. To determine the binding mode for all studied ligands, the ten poses for each structure were generated by using Glide v6.9 at standard precision level. All programs are part of Schrödinger Suite . The geometries of the studied systems were fully optimized using the QM/MM:ONIOM method implemented in the Gaussian 09  software. The high-level ONIOM calculations were performed for binding site, i.e., the ligand and amino acids placed a distance less than 4 Å from the ligand. The Csp3-Csp3 bonds of amino acids were a boundary dividing the studied system, which consequently has given 254 high-level atoms (in the case of compound 1). The rest of the protein was assigned to the MM fragment described by the AMBER  force field. The DFT method B3LYP [30, 31] in combination with split-valence basis set 6–31G* [32, 33, 34, 35, 36, 37] was used for the optimization of the high-level region and the minima were confirmed by absence of imaginary frequency. Although the common ONIOM calculations use 6–31G*, previously studied systems contained a significantly smaller QM fragment. Here, we studied complexes which would require much higher calculation costs. Recently, a similar calculation protocol (ONIOM and next FMO) was applied by us to study metabotropic glutamate receptor 1 . To study the importance and the nature of L–R interactions, single-point FMO-EDA  calculations were performed for the all optimized complexes of 1–8 at the MP2/6–31G* level using the GAMESS program . The FMO calculations were performed for the ligand and receptor binding site. This strategy has been applied recently to other GPCRs [7, 11, 18]. The FMO input commands were set as default. The pair interaction energies (PIE) and all contributions to total energies (electrostatic–Ees, dispersion–Edis, charge-transfer–Ect, exchange repulsion–Eex, and the Gibbs solvation energy–ΔGsolv) were calculated as previously described [2, 4, 11]. The Gibbs solvation energy was calculated based on the PCM model. GaussView 5.0  and FACIO  were used for preparation of the systems and analysis of the results. In this way, the value is always positive and considers the different signs of contributions. The above parameter could be read in such a way that 100% means a purely polar interaction. The value 0% means simultaneously 100% of the dispersion energy, which could be interpreted as a purely hydrophobic effect. The following example was prepared to exemplify in more detail how the approach works. For instance, ligand 2 complexed with the 5-HT1A receptor, among others, showed interactions with I3.29 and D3.32, for which the PIE and contributions to the total energy were calculated (Table 2). Using the above-mentioned formula (2), the %Ees + ct was estimated and illustrated in Fig. 2 later in the manuscript. The values calculated in this way suggested that the interaction with D3.32 is very strong and electrostatic in nature (characteristic for the salt bridge ), whereas in the case of I3.29, the main contribution was the dispersion and the interaction was medium-strong (characteristics have hydrophobic interactions). Additionally, the calculated values were consistent with hydrophobic effects estimated by Lockett et al. .
For PIE visualization purposes, Python scripts were prepared and executed in PyMOL v1.7.4. . The notation of residues is uniform in work and means a one-letter amino acid symbol and the sequence-based generic GPCR residue number based on the scheme proposed by Ballesteros–Weinstein , e.g., D3.32 means aspartic acid located at position 32 in the third helix. The orthosteric binding site of serotonin receptors is well known [11, 23, 45, 46, 47, 48, 49, 50, 51, 52] especially in the context of ligands having basic nitrogen in the structure, e.g., long-chain arylpiperazines [23, 45, 46, 49, 50, 51, 52]. Among all serotoninergic receptors, the structure of only three has been resolved so far. Thus, homology modeling and other structure prediction methods were extensively used in the study of ligand–receptor interaction in this subfamily. However, the quality of obtained models can be affected by the template choice or/and options used in the software. Moreover, using homology modeling approach, the identification of the optimal receptor conformation for a given ligand structure is very difficult. One of the recent findings showed that this problem can be partially solved by using induced-fit docking procedure where both ligand and receptor conformations are optimized. In this study, the FMO method was used for the first time for the characterization of three non-crystallized serotonin receptors (5-HT1A, 5-HT2A and 5-HT7) using a set of active ligands (Table 1). The results indicate that ligands 1–8 were bound in a typical manner and showed all key contacts, such as salt bridge with D3.32 and π–stacking with F6.51/F6.52 . The deeper energy picture of the binding sites of 5-HT1A, 5-HT2,A and 5-HT7 receptors give the ab-initio FMO-EDA calculations and both attracting and repulsive interactions were identified (Fig. 1). Among the non-specific interactions, there were very strong attractive one with D3.32, three stabilizing with I3.29, W6.48 and F6.51 as well as two destabilizing contacts with T3.37 and Y7.43. The results confirmed the nature of the salt bridge, and interactions with the aromatic residues of TMH6. However, the repulsive interactions were more intriguing. The first one, with the threonine 7.37, seems to be rather specific to that group of ligands because until now it has not been mentioned as the key in any modeling studies. However, the repulsive nature of interaction with tyrosine 7.43 was unexpected. After all, this contact is observed both in 5-HT1B and 5-HT2B crystals [53, 54, 55] and is mentioned in many modeling studies for various serotonin receptors [11, 23, 45, 46, 47, 48, 49, 50, 51]. Considering, for example, the 5-HT1A receptor (Table 3), docking studies indicated a specific π-π or π-CH hydrophobic interaction [48, 56], while optimization of the binding site using the ONIOM method even showed the possibility to form hydrogen bonding to the ligand . This phenomenon, however, can be explained in the context of the adjacent salt bridge with D3.32, which is the anchor point of the ligand, while the repulsive effect may be one of the elements of signal transduction in the receptor, i.e., the interaction causing the change in protein conformation. This argument requires more research, both theoretical and biological. Also significant was the interaction with the residue 7.36, which was stabilizing in 5-HT1A and 5-HT2A, where the neutral (hydrophobic) alanine and polar asparagine are located, respectively. In the case of 5HT7, there is positively charged arginine and it changes from attractive to repulsive depending on the ligand. The significant PIE difference even between similar structures 1 and 7 was obtained (Table 1 and Fig. 1). However, looking at the conformations of both ligands in the binding pocket (Fig. 2), it can be seen that after ONIOM optimization the ligand 7 adopted a different arrangement of the phthalimide moiety. The specific interactions for 5-HT1A receptor were destabilizing with I3.40, F5.47, R181ECL2, S182ECL2 and attractive with residues E179ECL2 and D180ECL2. The most significant were the first two residues. The extracellular loops have a flexible structure and their conformations in the homology models depend on the template and modeling method. Contact with I3.40 occurred in five out of eight cases and it was always repulsive. This very weak hydrophobic interaction involves the aromatic system of the ligand (chlorophenyl or methoxyphenyl ring) and the alkyl chain of isoleucine. The interaction with F5.47 has a similar nature. That residue is located in the same area as the previous one and also interacted with the aromatic part of the ligand. The significance of this contact is indicated by another more extensive theoretical work  where this interaction was classified as specific for the 5-HT1A receptor versus the 5-HT7 receptor. For the 5-HT7 receptor, results also indicated several specific interactions (Fig. 1). First, the interactions with residues D227ECL2, G230ECL2, C45.50, L45.51 and K229ECL2 located in the second loop should be listed, where the first four were attractive, while the last was repulsive. Moreover, the destabilizing effects from F6.52 and R6.58 and the attractive one with E7.35 were observed. This is compliant with findings of Salerno et al. 2014  where the same residues were pointed as 5-HT7 specific. For the 5-HT2A receptor, there are no specific interactions. In this work, PIEDA calculations were performed (Fig. 3) and revealed that the binding sites of the studied serotonin receptors are highly polar. The contribution of electrostatics (Eelect + Ect) in the total interaction energy (PIE) for key amino acids (I3.29, D3.32, T3.37, Y7.43) was above 70% and for W6.48 exceeded 60%. Only the interaction with F6.51 can be attributed as the hydrophobic, although not fully predominant. This seems quite intuitive considering a formal positive charge of ligands, which in consequence must have an effect on the nature of the interactions. Generally, in the context of previous works compiled in Table 3, the binding mode of the 5-HT1A receptor for this group of ligands is typical. There are only three interactions not considered yet—two are repulsive, with residues of TMH3 and located at the bottom of the binding pocket (discussed above I3.40 and T3.37), and another with threonine T7.32, located at the top of the binding pocket that stabilizes the L-R complex. In addition, the FMO methodology allowed complementing or confirming the nature of interactions, postulated so far as crucial for the 5-HT1A receptor. For example, the interaction with S5.42, which was considered as a polar and core contact [48, 56], caused stabilization of the L-R complex. Contact with N7.39, which was often engaged in ligand binding, being either an acceptor of hydrogen bond [22, 24] or forming dipole–dipole interaction , based on the FMO calculations is a highly attractive interaction. For ligand 1, the in vitro activities towards the studied receptors are known (Fig. 4), however, the total energies did not correlate with the experimentally determined Ki constants. Ligand 1 was bound into all receptors with comparable potency (PIE was − 180.0, − 169 and − 188 kcal/mol, respectively), although experimental studies showed strong activity at 5-HT1A receptor and moderate with respect to the remaining ones. Since 1 acts as a 5-HT1A and 5-HT2A agonist, and 5HT7 receptor antagonist (such as aripiprazole [45, 58]), Fig. 4 analysis allowed to hypothesize about its molecular mechanism of activation/deactivation of receptors. For the 5-HT1A receptor, there were two repulsive areas and one large area of attraction. Abandoning interactions with residues in extracellular loops, the ligand was strongly maintained by an anchor with D3.32 and a series of interactions with residues from the upper and middle region of the binding pocket, engaging most of the helices and “keeping” them together. The destabilizing L-R complexes regions were located in the lower part of the binding pocket and could potentially be responsible for the deformation of the helix system into the proper state (active). The first, weaker and hydrophobic, involving amino acids from helices 3 and 5 (residues I3.34–I3.40, A5.46 and F5.47; Fig. 4 and Table 3). In this part, a voluminous phenyl ring of ligand 1 was placed. The second region, strongly repulsive and polar, is the last contact of 1 with helix 7, i.e., Y7.43, already mentioned above. In the case of the 5-HT2A receptor, the arrangement is similar, with the difference that fewer amino acids are involved in repulsive interactions. For the 5-HT7 receptor, there may potentially be another repulsive pocket located closer to the extracellular part of helix 6, which engages residues R6.58 and F6.52. The applied approach (ONIOM/FMO-EDA) allowed us to obtain an energetic map of the binding site and facilitated the determination of the significance of individual interactions in the ligand–receptor complexes. The results showed that studied orthosteric binding sites of selected serotonin receptors have both attractive and repulsive regions. In the case of 5-HT1A and 5-HT2A two repulsive areas, located in the lower part of the binding pocket, and one large area of attraction engaging many residues positioned closer to the extracellular part of the receptor were identified. Additionally, for the 5-HT7 receptor, a third area of destabilization located at the extracellular end of the helix 6 was found. The correlation of these findings with the mechanism of receptor activation is currently at the center of our scientific interests and will be published in the future. Consideration of the nature of binding pocket regions in serotonin receptors could be an inspiration to design new molecules for these targets. The study was financially supported by the National Centre for Research and Development, Project LIDER VI (No. LIDER/015/L-6/14/NCBR/2015). The authors acknowledge the computing resources from PL-Grid Infrastructure. We are grateful to Prof. Andrzej J. Bojarski for research support and to Grzegorz Satała for bioassay results.